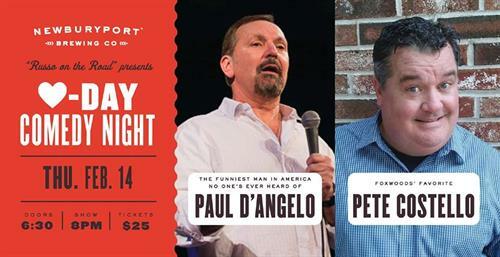 Valentine’s Day Comedy Night - Paul D'Angelo and Pete Costello at Newburyport Brewing Co.
Russo on the Road presents Valentine’s Day COMEDY NIGHT! Featuring “The Funniest Man In America No One‘s Ever Heard Of" Paul D’Angelo and “Foxwoods’ Favorite” Pete Costello! PERFECT DATE NIGHT! Doors at 6:30 - show at 8 PM.